Trócaire has launched an appeal for donations as more than 2.5 million people have been left in urgent need of humanitarian aid after Cyclone Idai destroyed large parts of Mozambique, Zimbabwe and Malawi. Trócaire reported that the cyclone hit last weekend, leaving people in need of shelter and food. “People in the region were waiting for rain so as their crops could grow, but what hit them was a cyclone that has destroyed everything in its wake,” said Caoimhe de Barra, CEO, Trócaire. “The long-term implications of this cyclone are enormous. People in the region could be left facing months of hunger as a result of the loss of crops,” she said. She added that Trócaire is working with local partners in the badly affected areas to provide emergency relief to families who have lost their homes and crops. Donations to the Lent Appeal will be used to support people in Zimbabwe, Malawi and Mozambique, as well as in other parts of the world where people are in urgent need. Details of the cyclone are just emerging. It hit on Thursday evening local time with mild rain and strong winds but soon developed into a full-scale cyclone that lasted until Sunday. Trócaire’s local partners have been assessing affected areas. 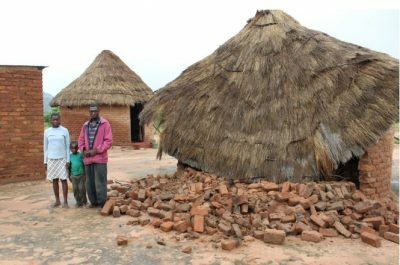 In one village of 350 houses, they reported that 30 per cent of the houses were completely destroyed. The cyclone has left many areas inaccessible by both road and air, meaning that no official assessment has been done in large parts of the region, so the final figures for those affected are not yet known. On Wednesday 20 March at the General Audience in St Peter’s Square, Pope Francis asked for prayers and support for the many victims of the cyclone, expressing his condolences for the families of those killed, as well as his solidarity with the millions of people affected. The bishops expressed their condolences for the death of 45 people and launched an appeal to deal with the damage to property and livestock caused by the floods. The bishops commended the head of State for declaring the floods a national disaster, which they say would encourage goodwill and support from donor partners as a matter of urgency. Fides reported that as of 20 March 2019 the death toll was 45, with 577 people injured and 147,958 households, representing 739,790 people, displaced.